How Does Adopting The Cloud Accelerate Innovation? A collaborative report between Binx.io and Computable, Cloud Survey 2018: Dutch Skies looks at the current state of cloud technology in the Netherlands. Discover the most popular cloud platform, technologies, and service providers of the Netherlands; the main move-to-the-cloud drivers; and more! Download the Binx.io Cloud Survey 2018 for a shared insight from business professionals on every cloud topic - from adoption, obstacles, and multi-cloud strategy to the most popular providers per industry and company size. 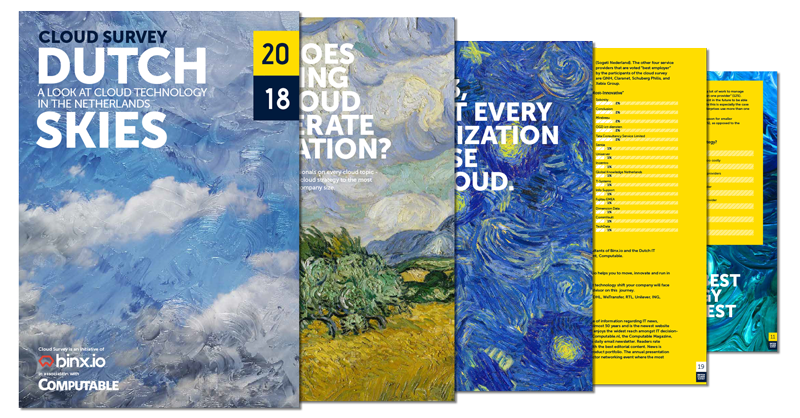 Download the FREE 2018 Cloud Survey: Dutch Skies report now.